After putting some light on the topic of Installing FieldOne, from Microsoft let me introduce you to some basic elements to narrow the question: Do you need to spend hours before you can use it? 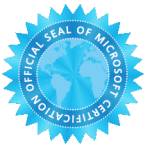 Assuming not everyone has heard of FieldOne, from Microsoft or FieldOne Sky – What am I talking about? 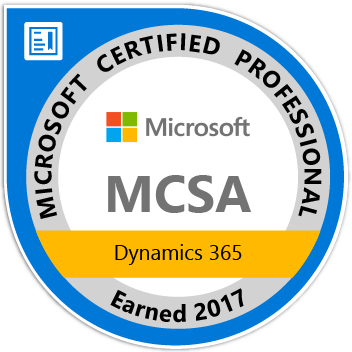 Reading yesterdays article from our new leader of Microsoft’s CRM Business Applications group – Jujhar Singh – you´ve already recognized it is something around field service capabilities within Microsoft Dynamics CRM. 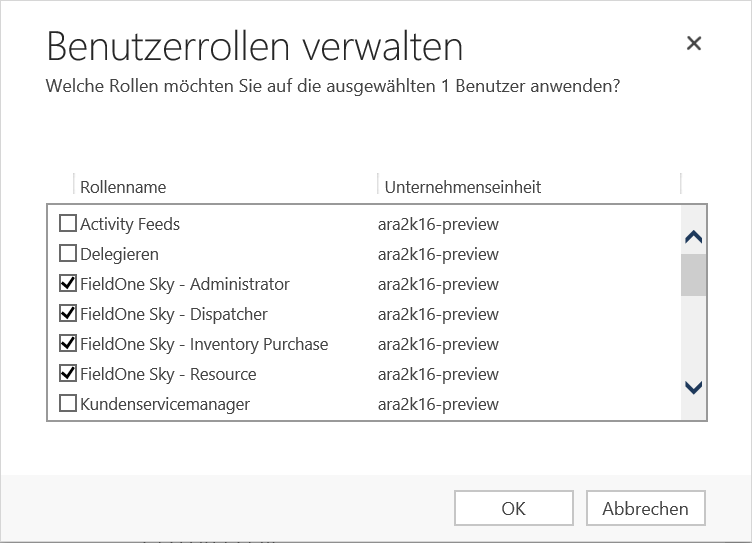 FieldOne Sky is a field service management solution build on top of the xRM Framework of Microsoft Dynamics CRM. Leveraging the power of existing service capabilities and enhancing CRM with newly introduced entities as well as combining an intelligent scheduling service to calculate and optimize work orders, FieldOne Sky is an offer to all companies searching for a better scheduling and field service management. Blocking out a slot on the Schedule Board directly and selecting unscheduled Work Order to schedule. Once you feel familiar with that kind of scheduling, you probably want to use the Scheduling Assistant which you can launch either from a Work Orders view by selecting a Work Order and choose Scheduling Assistant from the Ribbon or inside an individual opened Work Order – e.g. in a typical customer service call scenario, where you created a new Work Order and now want to provide a fitting and optimal time slot for that customer. But FieldOne, from Microsoft also allows a field service engineer to provide status updates using a mobile field service application based on Resco, re-scheduling himself or simply create follow-up Work Orders if needed. And because of providing Field Service Management capabilities it also takes care of customer assets, engineer time sheets and invoicing and inventory management. So there´s a full packaged managed solution staying inside your CRM system once you´ve installed it. But let´s focus on some key elements first. One of the key areas and probably the most used interface after creating Work Orders or Work Order Schedules, is the newly introduced Schedule Board. This HTML5 based interface combines a closer look into all necessary data for dispatchers, managers or other by security role allowed users with the power of a list view, a digital map, a details tab and a GANTT view. 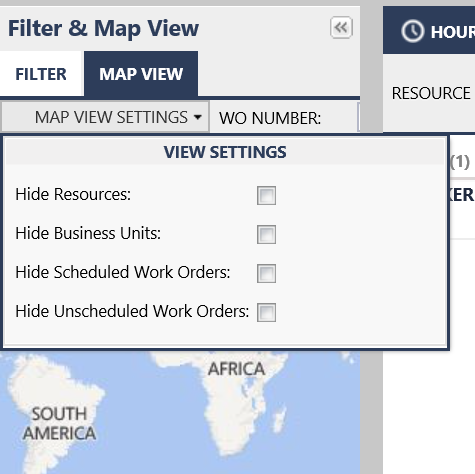 Within this single UI presenting an overview of current status, planned and unplanned Work Orders – A dispatcher can perform typical actions like reassigning Work Orders, schedule unplanned Work Orders or taking a closer look on a digital map interface and provide driving directions to field service engineers while watching their team, their region or other information. The UI is controlled and configured by setting up views with filters using the well known concept of advanced find. But as always – with high flexibility comes great responsibility – to train your users in arranging their daily life within that interface and make it work the way they want. As said earlier installing the solution is pretty easy, but if you open the Schedule Board the first time after installation you recognize an empty GANTT view after a short loading time. This is because of the need of several configuration steps, before being able to make use of the solution and all components. Without training or at least a checklist what needs to be done first, you probably end up in having a nice looking HTML5 Schedule Board. But you can start playing around and look for configuration – as I did. And you will find the Map View Settings if you expand the Filter & Map View on the right. And I guess you´ll also find the general personal settings of the Schedule Board when you click on the familiar gear wheel icon – normally used for any kind of settings dialog. You will also recognized four newly installed Security Roles you can assign to your users and of course you can explore all the different privileges introduced by each security role, though you won´t find a best practice which role needs to be assigned to which user. Again – this is what I would call a business solution issue. It needs training or a kick-starter package by an Implementation Partner to help with these questions. it also introduces some typical custom entities needed to close the gap between offering out-of-box CRM capabilities and Field Service Management capabilities. Some might recognize that the icons haven´t been updated yet in my environment – I bet this is subject to change soon as well. It takes time if you´re not familiar with a Field Service Management solution to configure the basics. It needs a training – some best guidance – or at least a checklist of what needs to be configured (which by the way I´m going to cover in my next article) – but remember: Though the solution installation was made easy, it is a business solution closing some gaps or fulfilling requirements you´ve came up with to introduce a better Field Service Management and enhance customer service capabilities. 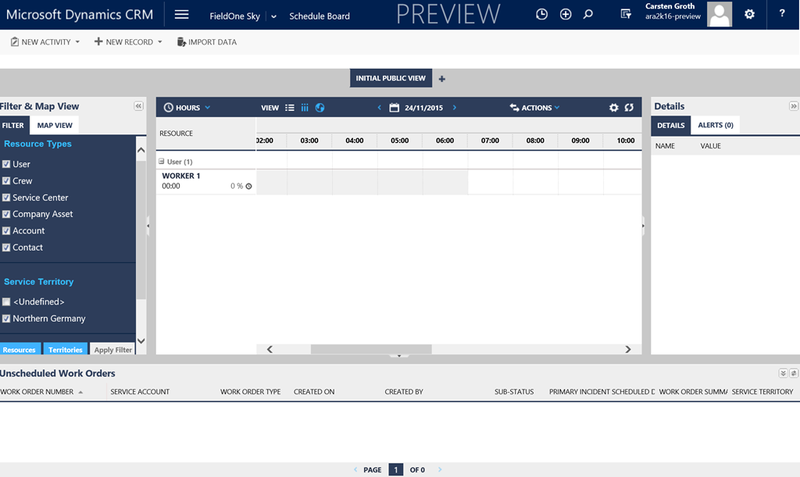 For a typical presentation preparation with at least some daily scheduling scenarios a dispatcher can run into, an estimated duration of 2 business days is needed to setup and configure FieldOne, from Microsoft. Additionally you should calculate at least half a business day to prepare Resco and the mobile status feedback scenario or self-scheduling. Maybe we will see something like a “quick start” guidance with some demo data that can be installed to ensure a well configured system can be evaluated without training first. For now – ask your preferred Implementation Partner to help with.